Most real-world use consists of a mix of reads and writes, and interleaving the two often poses a particular challenge to drive controllers. 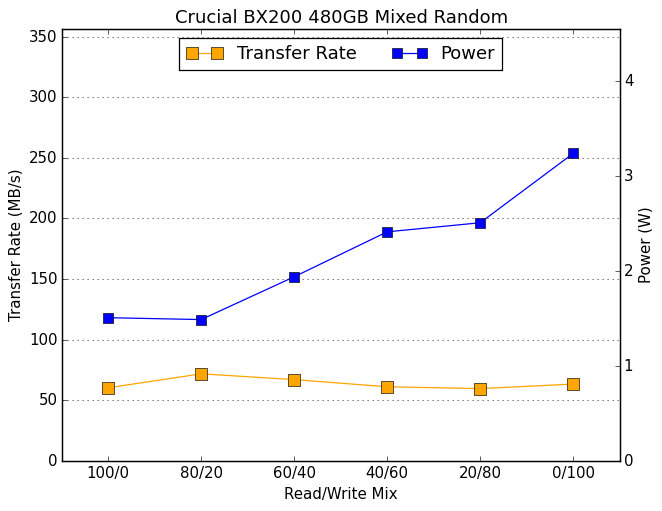 This mixed random access test is conducted across a 16GB span of the drive, with a queue depth of 3. 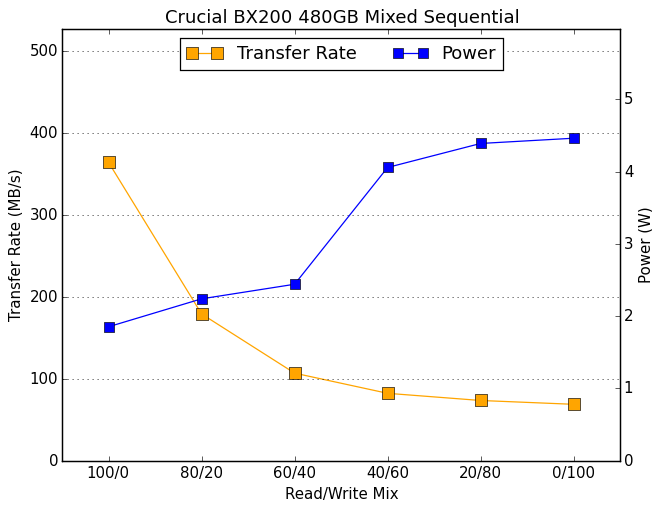 The BX200's reasonable read speeds are apparently able to compensate for the write performance enough to keep at least the 960GB BX200 out of last place for the mixed random test, but the 480GB only manages to surpass a 120GB drive. The power draw is even more mainstream than the performance, because despite being inefficient the BX200 isn't unreasonably power hungry in an absolute sense. Slow and steady doesn't win the race here. 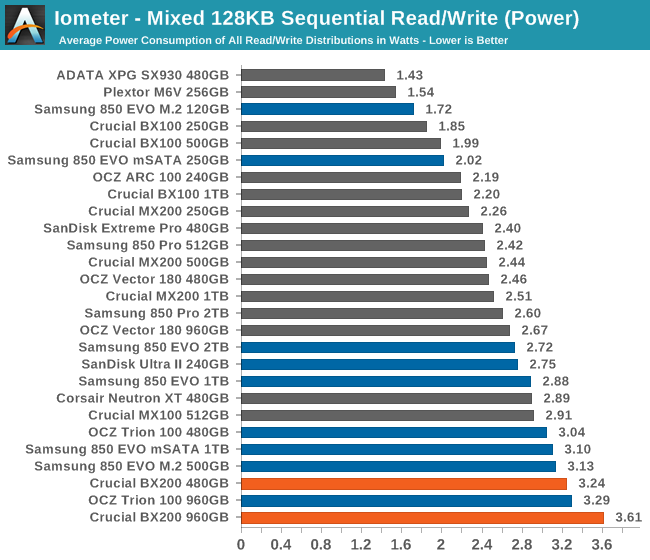 Most drives gain speed near the end of the test for the write-heavy portions, but the BX200 gains no performance as the power consumption climbs. It doesn't have the slight bathtub curve shape in the middle the way the Trion 100 does, which is how it keeps pace even without the boost at the end. At either end of this test, when the workload is heavily skewed toward either reads or writes, most drives perform well. In between, performance typically suffers greatly, and that's where the winners and losers of this test are usually determined. Anything that's duplicating or transforming a large amount of data on the drive will produce I/O patterns similar to this test. Creating a System Restore snapshot, backing up files to a different location on the same drive, and file compression can all produce interleaved reads and writes of large blocks of data, though not necessarily fast enough to be limited by the drive's performance. Heavy multitasking can add up to a mixed workload. 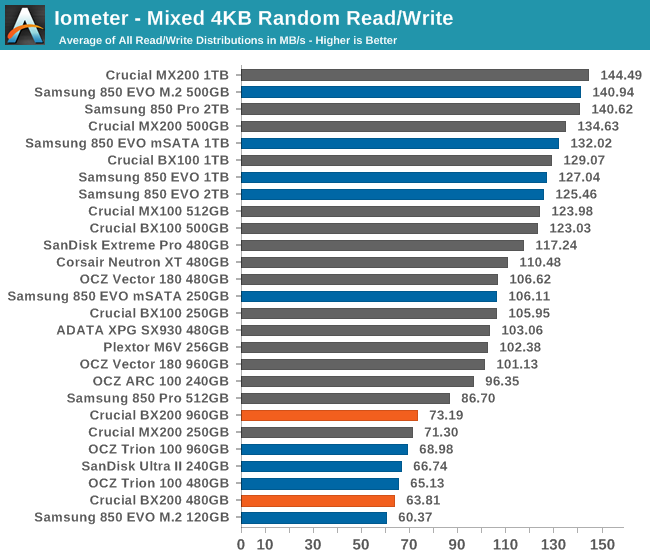 With average read speeds and poor write speeds, the BX200 is in last place for the overall average, since the competition didn't have any acute weaknesses. 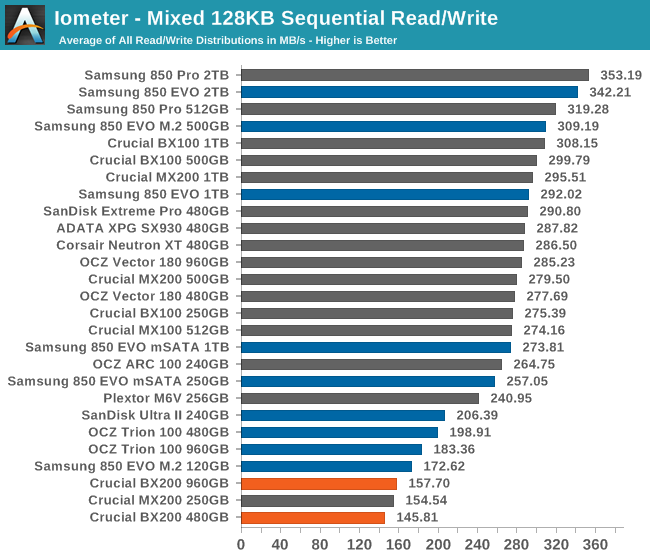 Average power consumption is once again high, and the 960GB is a particular outlier. The graph of performance as more writes come into the mix shows just how quickly things get bad. 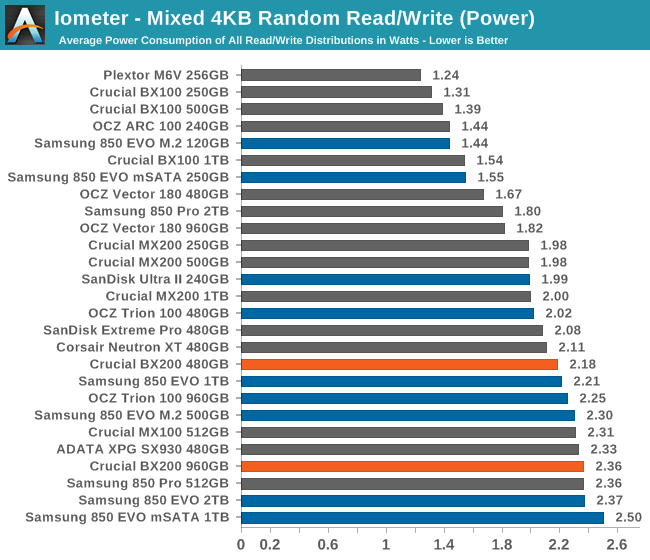 There's a big jump in power consumption once writes are more common than reads, and the drive is almost as overwhelmed at 40/60 as it is for the pure writes. Reminds me of Hitachi when they bough the IBM dextar drives. anyone remembers the horrible failures of the 10k and 15k rpm drives under IBM? even their consumer disks were dying like mad. They sold their business to Hitachi who fixed the mess. For several months now, on a near-weekly basis, Samsung Evo drives are hitting sale prices of ~$150 for 500GB and $75 for 250GB. Except for customers not paying attention, Crucial is gonna have a tough time moving these bx200 when there's unproven reliability, almost no price advantage, and a huge performance deficit.